It’s the standard now and it will still be the standard for connecting with your audience in 2030. And that’s why I’m covering it, once again, in my new book, Future Marketing: Winning in the Prosumer Age. Now, understand that creating content for experiences—customer and user experiences—will also be a part of that connection in fifteen years, but that’s still content marketing. It’s just the “experience” version of it. In addition, creating content for “the platform” (and not only for the brand) will also be critical in the future. The other thing to understand is this: the practice of using valuable, relevant content instead of ads has been one of the key changes in marketing over the last ten years. And it has helped usher in the new age of marketing. Why? Because content connects you with your customers in better ways. It builds the relationship. Ads don’t do that. I don’t know about you, but an ad has never helped me feel closer to the companies I do business with. The only thing I feel and think when I see an advertisement is, “oh, this company wants me to buy something from them. And they’re interrupting what I’m doing right now. Not interested.” Need further convincing? Ask a Millennial or Generation Z’er. The key here for my advertising friends is that we need to make ads better. And with the coming new technologies, we’ll be able to do that. So all is not lost! Again, it’s all about content and it always will be. Content marketing is the strategic marketing approach of creating and distributing valuable, relevant and consistent content to attract and acquire a clearly defined audience—with the objective of driving profit-able customer action. In short, instead of pitching your products or services, you are delivering information that makes your buyer more intelligent. The essence of this content strategy is the belief that if we, as businesses, deliver consistent, ongoing valuable information to buyers, they ultimately reward us with their business and loyalty. Content marketing is the act of sharing tips, advice, and other value-added information as a means of converting prospects into customers and customers into loyal, lifelong, repeat buyers. Utilizing the power of opt-in permission to deliver content via email, RSS feeds, social media channels, and other methods, your goal is to become a valued resource for hundreds and thousands of people who, in time, will want to buy what you sell. Over a period of weeks, months, and years, you’ll build a solid relationship with them and earn their trust. You don’t want to sell to them once and never see them again. You want to make a friend—a friend who enjoys buying from you—for life. So, there you go, plain and simple. 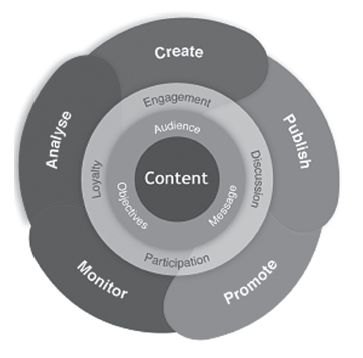 That is content marketing in a nut-shell. But, how do you make it work for you? Content marketing is about doing lots of things right: having a blog and establishing a platform? Check. Having a social media presence on Twitter, Facebook, YouTube, and other networks? Check. Providing free content in exchange for contact information? Check. Getting people on your autoresponder list and regularly sending them informative tips and advice about things that are important to them? Check that, too. In essence, you want to leave no stone unturned, showing up everywhere and anywhere your prospects may be hanging out online. Wherever they go, there you will be as well—with their permission, of course. They won’t be able to miss you. And you won’t miss them. Casting a big net that covers every area of your target sea will help you find all types of fish you’ve never seen or even thought you’d see. And that’s the key. If you start to feel like a publisher with all this content marketing stuff, well, then you’ll know that you’re doing things right. Like it or not, every-one is a publisher in today’s business world. Business veterans out there should just take a look at all the marketing activities you’ve done up to this point—it feels a lot like publishing, doesn’t it? Like a magazine or television station, you need to produce content—all types of content—for your consuming prospects. Before, you were just a provider of products and services. Now, you are a trusted expert resource for your customers! How do you create compelling content? By focusing on delivering relevant, valued information that people will notice. When you do this, you’ll generate trust, credibility, and expert status in your particular industry, and people will come to you when they are ready to buy. That’s it. Some people will be attracted to your content immediately. Some will only want the free stuff. Others will be “just looking.” And some will have the big bucks and want to spend it with you. Jon Wuebben is the CEO of Content Launch, the first complete content marketing platform built for digital marketing agencies & SMB’s. Jon has provided content strategy consultation for Konica, Minolta, Intuit, Kimberly Clark and dozens of marketing agencies. His latest book is Future Marketing: Winning in the Prosumer Age.